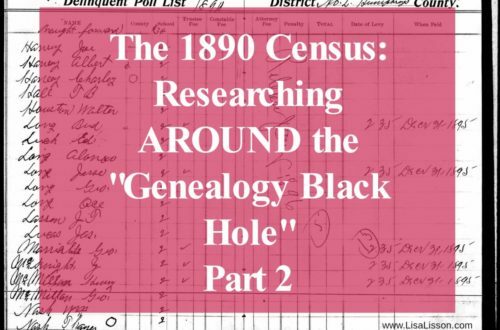 A Close Up Look At Researching The 1880 Census | Are You My Cousin? The 1880 US Federal census holds much information about your ancestor(s). 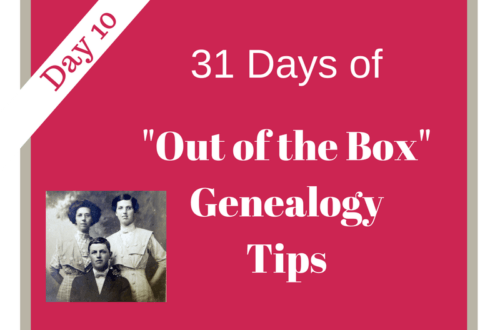 Are you missing clues within its pages that can jump start your genealogy research? 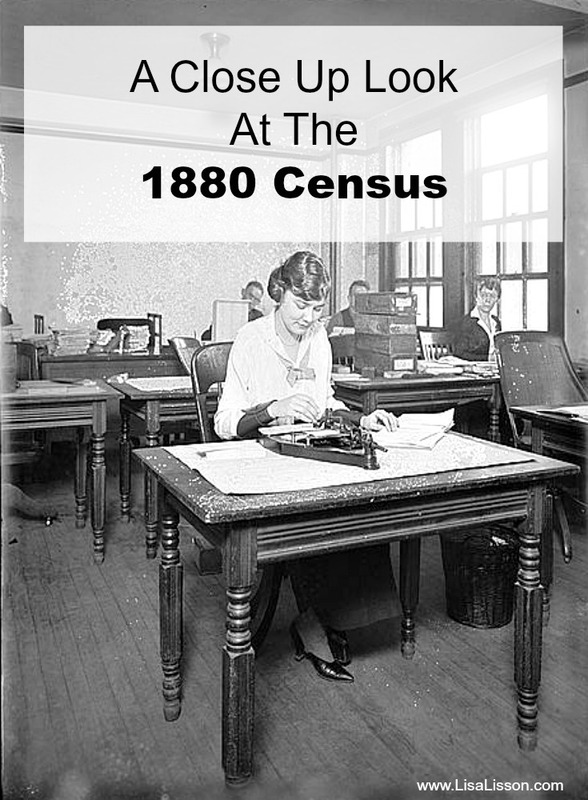 The taking of 1880 Census was authorized to be supervised by, well, “supervisors of the census” . These were presidential appointments and subject to senate confirmation. Each supervisor was in charge of organizing his appointed district, finding the enumerators and supervising the enumerators’ work. 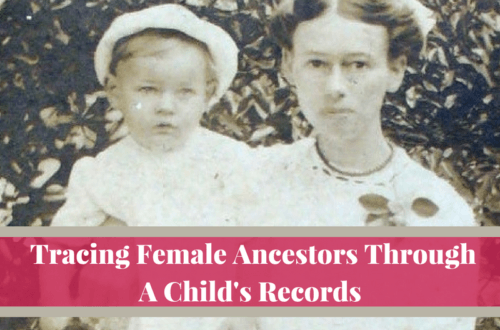 What happened when the census enumerator arrived to “count” your ancestors and they were not home? The enumerator was allowed to gather the information from the nearest neighbors. This could very well account for some of the inaccuracies we find on our ancestors in the census records. A blank 1880 census form is always a good thing to have on hand when you are analyzing a census record. The column headings can be difficult to read on many of the original census records. Start at the top of the census record. Determine the date the census record enumeration starts. For the 1880 census, individuals living on 1 Jun 1880 were enumerated. If the census taker arrived at your ancestor’s house on 24 Jun 1880 and a family member died on 15 Jun 1880, that person was to be listed. TIP – Knowing the enumeration dates of a census record can help narrow down an ancestor’s death date. 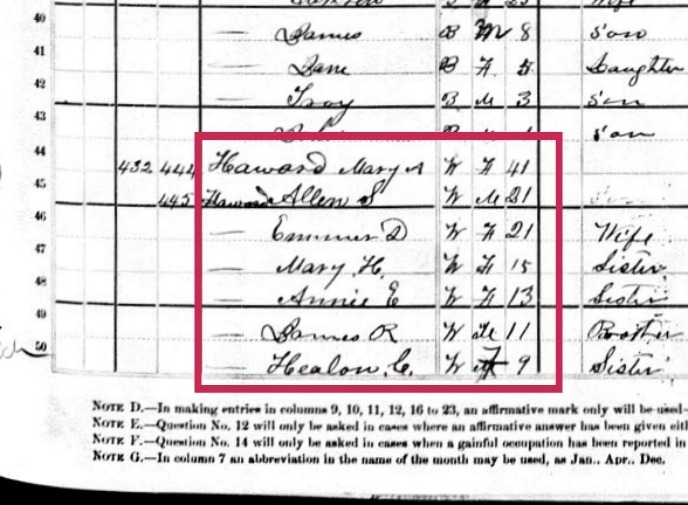 Let’s take a close look at the 1880 census enumeration for Allen S. Harward of Moore County, North Carolina. His mother Mary A Harward is listed, too. Immediately, you notice the spelling of his surname is “Haward” as opposed to “Harward”. [The family’s surname was traditionally Harward.] All other information provided aligns with previous research into the Allen S Harward family, so we know this is the same family. Each family member is listed along with their race, gender and age. Keep in mind that race was determined by the census taker’s visual interpretation, not by asking the individual what their race was. From the age provided, an approximate birth year can be calculated. 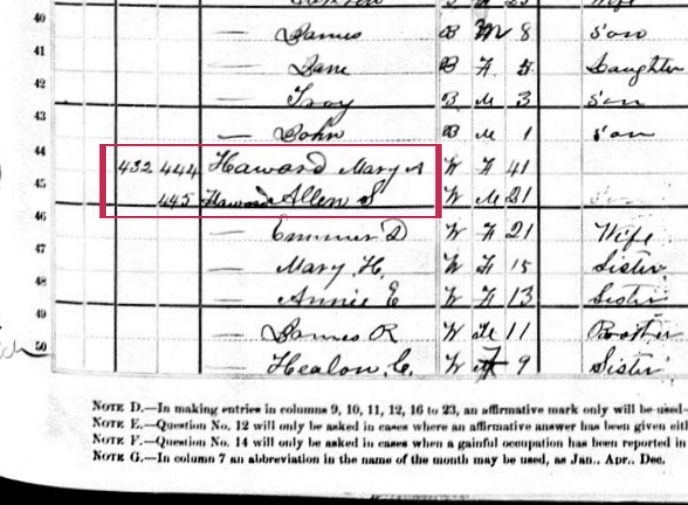 Allen S Harward was 21 years old indicating he was born in 1859. Notice the numbers to the left of Mary and Allen’s names. Ever wondered what these are and what they mean? The number on the far left – 432 – is the dwelling number. The number on the right is the family number. Mary is family number 444 and Allen’s is 445. These difference between the dwelling number and the house number accounts for multiple family units living in a single dwelling. 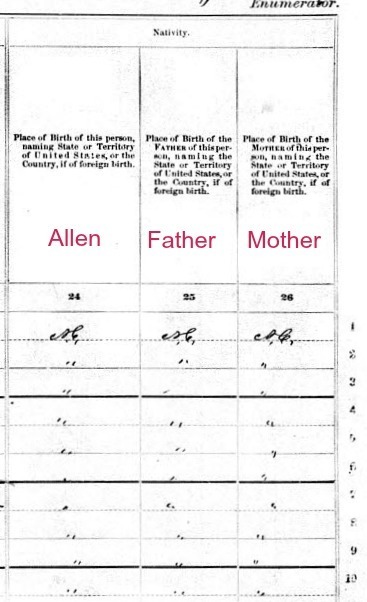 Based on this census record, Mary is considered one family (a family of one) and Allen and the others are considered a second family in the dwelling. The Harward family is a bit unusual with this as Allen is the head of the household that includes his wife Emma and his minor aged siblings. TIP – Mary is a widow (see below) and Allen appears to be the guardian of his minor aged siblings. A search for guardianship papers for these children is warranted to learn more about the death of the father. This is where we learn the relationship of the individuals to the head of the household. In this case, that’s Allen. Take a moment and note the marital status of the individuals. Mary is a widow. Allen and Emma are married, and the minor children are all single. This is as expected. Don’t neglect that far right column (just before the occupation column). If an individual was married within the census year, that was noted here. Allen and Emma were married prior to 1880, so this is left blank. Clue – if your ancestor had this box checked, you can determine a marriage year and narrow you search for a marriage record. TIP – Since Allen was a farmer, a search of the 1880 Agriculture Schedule is warranted to learn more about him. No 1880 Ag schedule exists for North Carolina. If Allen had lived in Alabama, for example, there is an Agriculture Schedule to research. The 1880 Census provides unique information into the health of your ancestor! [Remember, the terminology used was common for that time even though it seems harsh by today’s standards.] If your ancestor was deaf, dumb, an idiot or maimed/crippled? That information alone relates information on your ancestor’s life. TIP – If you ancestor was indicated to be one of the above, check the Defective, Dependent and Delinquent schedule. Read this recent in-depth post on the DDD schedule to learn more. Determine your ancestor’s educational status in the 1880 census. Could he read? Write? Was he attending school? In our example of Allen S Harward, all three of the educational type boxes are left blank. It is assumed Allen could not read or write OR perhaps a neighbor provided the census information and simply did not know. One of my favorite things on the 1880 census record is the nativity information found on the far right. The individual, his/her father and his/her mother’s birth places are recorded. Often you will find ditto marks as we find for the Harward family. We must go back up through the columns to determine the meaning of these. For the entire Harward family, we find them all born in North Carolina. Now for the best part! The 1880 census records where an individual’s father and mother were born. Allen’s parents were both born in North Carolina. To start research into the parents, one can start the search in North Carolina. Of course, errors do occur here, but having a place to start can jump start your research. TIP – Find a great starting point for the next phase of you research by learning where an individual’s parents were born. Go back and re-analyze the 1880 census record for one of your ancestors. What new information can you learn about him or her? Where do the clues that you find point for the next phase of your research? Enjoyed this post. The 1880 Census has always been one of my favorites because of the wealth of info. But I love the extra info you stated about the enumerators. Lisa, I am new to your blog. Just joined this morning and I want to thank you so much for the 1800 census information. The best tip I learned from you today was to start with a blank census. Thank you so much. Looking forward to your other posts. You are so welcome, Barbara! I’m glad you find that tip so helpful. 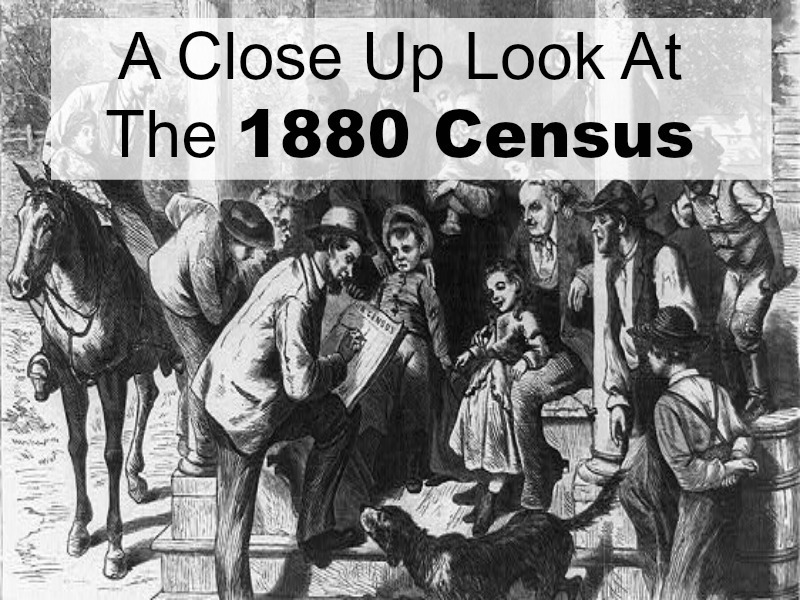 A Close Up Look At The 1790 Census | Are You My Cousin?